Modern Regular flex is rare, Pelikan 200 is regular flex. Can be had in vintage for @ cheaply if you look. Sheaffer $50 and under, Esterbrook $30, Wearever cheap; all made some; as regular issue way back when. 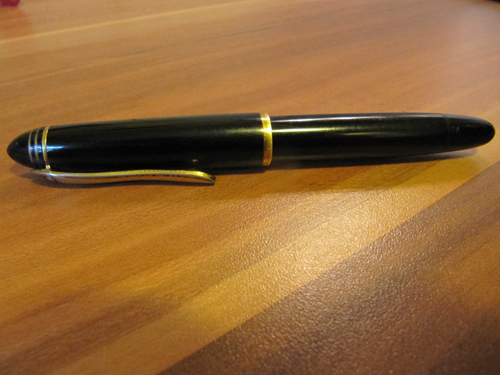 Of course one could buy a vintage semi-flex pen for $100, a Geha 790 is E60 on German Ebay. Could be lucky and run into a maxi-semi-flex pen too. AH Ha, you were talking about a superflex pen???? I think M or B will be very hard to find in superflex. When I was noobie I too was interested in a M nib on a superflex, never found one. I slowly got use to thinner nibs, so when I did get a superflex skinny was OK.
Superflex is all about having a real, real light Hand. I do have a wet noodle Waterman 52, I have to sweat to make it write EEF, think to make it write EF, so mostly scribble with it at F.
So getting one in F with a heavier hand will have it writing at M.
An Ahab or a Creaper (which are narrow nibbed pens) with a half moon mod, will made that (semi-flex nib which is a lot of hard work at that flex rating) a first stage superflex.......Easy Full Flex. What I suggest is buying a dip pen and a hand full of nibs......many at so flexible they flex when there is an earthquake in California and one lives on the East Coast. How ever they are EF or so in width. One can get wider nibs in Ornamental dip pen nibs, but they don't have any flexibility. Someone who knows dip pen nibs perhaps knows if there are any M or B nibs to be found in dip pens. Edited by Bo Bo Olson, 07 November 2018 - 21:39. Look around for a vintage Waterman 52 1/2 V.
There are no modern flex pens under a hundred unless you are willing to fiddle with a Noodlers Ahab or linear or FPR pen. A flexible stub or broad nib is going to be rare. And expensive. Edited by Honeybadgers, 08 November 2018 - 05:25. Unfortunately few are available on eBay but of poor cosmetic quality !! You need to at least double your budget. 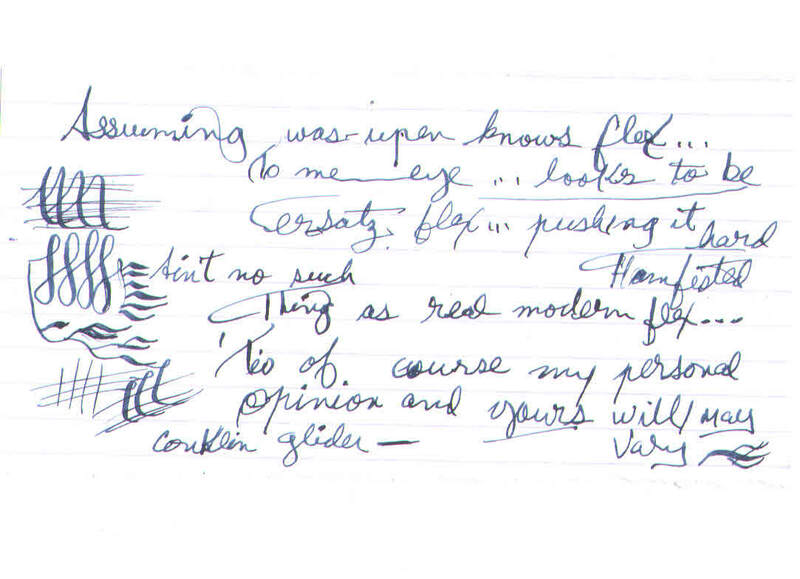 broad and flexible nibs just aren't a thing for how people used to write in the early 20th century. Broad nibs were not used for spenerian and older cursive, where flex nibs were used. You wanted the difference between hairlines and not. There is ONE option I can think of. But you're going to have to spend some money. Pablo at FPnibs.com can take a 14k B nib from JoWo in #5 or #6 size and customize it for semi or full flex. You're looking around $150 for the nib alone. But it'll do the job. I'd not waste the money honey badger is talking about for a semi-flex version of that Japanese nib; when you can get semi-flex in B or if you look hard enough in BB or OB and OBB, for E60-120. There are some three stages of superflex, first stage, Easy Full Flex, what you reach when you half moon an Ahab. Wet Noodle......and Weak Kneed Wet Noodle....something I want no part of. I'd more expect the superflex honeybadger is talking about to be more Easy Full Flex than a wet noodle. It is a much more fun nib than an unmodified Ahab. And you can get it in M and or B. There are lots of odd custom jobs with grinding half moons, lines...a so called tomahawk grind. Those nibs are not going to last a life time, but should last for 3 or so years. Semi-flex can be had with nibs that will last the rest of your life on German Ebay at a fair price.......if you stay away from the Buy Now Idiot button. One German Ebay, Geha 790 (now more expensive @ E-60, and Osmia has become cheap, now E60. You might well have to re-cork the Osmia's but then it's good for the next 70 years. Don't try to O ring them, O rings are dangerous to true vintage piston pens. *** Properly treated cork is the best and smoothest gasket material. They are not Ahab's or Twsbi's which were designed for O rings. That guy Mike? who re-tips nibs, might have a real superflex nib floating around in M or B, e-mail him. In I'm in Germany I don't keep track of stateside nibmeisters so forgot his name, but he is one of the Top Three. I didn't hear of any of them before !! Has anyone tried them ? Edited by mns68, 08 November 2018 - 18:01. Consider a vintage pen with real flex from a reliable source. Schneider-Trabrant, must be East German...in I'd not heard of it either. Trabrant was what they called their cheap car...once so cheap a VW looked like a Mercedes vs it. I eyeball that script to semi-flex.......3X a light down stroke tine spread. I'd not spend more than E25 on it, if I was in a good mood. The nib is OK...the rest of the pen looks rather cheap. You can get better for that E70-$75. I live in Germany. When I was buy anything cheap 'noobie' in the Pen of the Week in the Mail Club...a decade ago, Buying E15-20 :yikes:and then up to a whole E30 , I never noticed the Scheider Trabant. Markant the bigger E. German pen company was rather seldom and sold dirt cheap, in none in the West wanted any of them. If I was to ever sell any of my pens, I'd only sell them in the States. :lticaptd:and with a high Buy Now Idiot price. 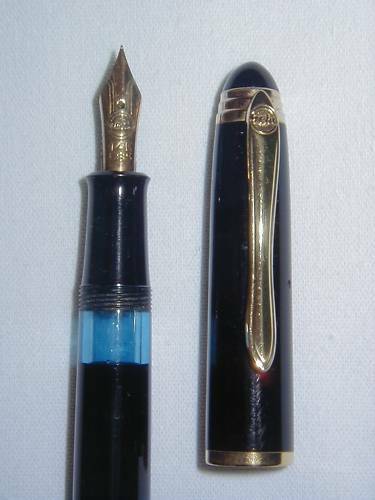 A 'late '60-60's Geha 790 is a very solid well made, semi-flex standard sized pen (Same size as a Pelikan 400 or Esterbrook DJ, made and did compete vs Pelikan across town. I have three 790's. Can be had if you hunt, for E60 or less!!!! (of course no free mailing...the seller is not a professional pirate. You want one with three 'rings'....none but the clip ring is a school pen with a nice regular flex nib....has a serial number so the pen wouldn't be stolen in school. For a regular flex nib, the best buy at E12-19...or only $89 by German pirates selling to the US. The Geha 790 is the best buy for semi-flex. Some 30-40-50 Euro cheaper than Pelikan. All Gehas have a reserve tank to get a page or two more if you run out of ink. When I buy a pen, I get the picture. The rare 790 @ '59-60 cleaned up better. Torpedo was very IN, the Pelikan 120/140 and later 400nn, Swan, MB, some Osmia, plus Geha were all Torpedo. Posted it is a very well balanced pen, or I'd not have three and a medium-small and more costly 760. To show the 'more modern' three rings. Geha 790/760 nibs are a slight tad springier in semi-flex than Pelikan . Two posters I respect posted that, and I checked my '50-60's Pelikans vs my 'late '50-60's Gehas and they were right............nothing you'd notice if you didn't have both pens. A medium-short but long posting Pelikan 140 goes for E90-100, a same sized as the 790 400 goes for E100- and if you are in a huge hurry, can be had for 120; but if You Hunt, you can get it for E-100. Hunting is fun....as soon as you get the Buy Now upbringing out of your head, from all your life....mine too, TV advertisement....buy, buy, buy. Go into the past auctions, see what the pens went for...do an average and stick to it. The pens' twin brother will be there next week or the week after at latest. Just think how much inks and good papers you can buy with a spare $100. Edited by Bo Bo Olson, 08 November 2018 - 19:51. So I think, for a broad, flexible nib, without a LOT of patience, pick up a TWSBI pen like a VAC700R or mini from pablo at FPnibs and order a broad 14k JoWo for it, ask him to give it full flex (I do recommend semiflex for normal writing. my full flex pen is an XXF but it's too flexible for everyday use on normal paper, even the XXF is a firehose) and have him tune and adjust the feed to fit it. You'll be in the $200 range, but it'll do the job exactly like he wants. Edited by Honeybadgers, 09 November 2018 - 03:25. Is there any Chinese brand that offers FP with flex nib ? What is your opinion about Noodlers FP with flex nib ? , """"a B or OB flex 400NN is gonna cost damn near 600 bucks, and the stub doric I got to use was probably a $1500 pen at the minimum)"""""
I have been wasting my time scribbling. ..and there has been a huge increase of those who will mail overseas, but not to the ecologically unfriendly USA. I'll take a quick look for you. Wait one. PM sent. It's hard not to tell 'noobies' save a lot of money, buy a good pen; get one by Hunting once a week...and waiting, and waiting for a good deal, at one's budget plus a max of 10%. Hard when one has been conditioned from as soon as one could sit up in ones dipper on TV to Buy Now...why wait and save money, you deserve it yesterday, what are you waiting for fool, part with your money, do it now, push the Buy Now Idiot button. The problem is semi-flex Sheaffer is rare. From the early '50's. Esterbrook's semi-flex is not very. Whal Eversharp from the '40's is semi-flex and has also pens with that adjustable flex nibs. In the '30's Waterman and Whal-Eversharp made flexible nibs up to superflex. Not all Waterman '52's are superflex. (a decade ago, most 'noobies' came in looking for cheap pens and were directed to the Esterbrook (then $15 now $30), Safari and other cheap American vintage Parker and Sheaffer pens in the $25-50 range. Now they are coming in from Cheap Chinese pens and no longer know or need more time than their older brothers to learn to hunt on Ebay...........Never, Ever get into an Ego bidding war. Make one bid and that is that! Use a snipe program. Mns68, look in our sales section, it costs a bit more than hunting in the wild of Ebay....but will work, some poster here has backed it with his good name. I am at the well, so I get , when I see what water prices are a block or three away. I accept all blame, I and I alone am at fault about the jump in the prices of the Geha 790. Once, a decade ago they cost only E15-$20.....so I told everybody. .....then they went to E30....and now to E60....in they are still the best buy in semi-flex. Next best buy is the Osmia, which you might have to get re-corked, but there you can get the Osmia with a small diamond and mostly a nib size in the diamond, that is semi-flex.........the large diamond or no diamond but both with Supra is maxi-semi-flex...........and a steel or gold nib in either Osmia or Geha is just as grand..............don't buy into the gold is better myth "BS". It's deep water............. .............until you put your feet down and find out it ain't. Germany stayed semi-flex a generation longer than the US. But, I think OP has a dream of Olympic splits in nibs, instead of semi-flex. Keep in mind for down the road. Right now semi-flex might be... is that all it is?....instead of that is all one needs? Edited by Bo Bo Olson, 09 November 2018 - 13:36. Go find a eversharp adjustable nib with broken adjustment slider. Normally they go around $100 and I happen to get one under $50 from Ebay. IMO, not a lot of people will disagree that's a vintage flex. Very good price.................should be a semi-flex.....could be a maxi-semi-flex. Mine 400nn OF is. My 100n post war, green ink window is superflex, first stage Easy Full Flex will go 5X, but I strive to keep it at 4X. Richard Binder has a great article over on his site, about metal fatigue in nibs. In maxi, I have that 400nn, an Ibis and a 500 OBBB 30 degree grind signature pen. The 120 like the later 150/200's is regular flex. From that era I have two 140's and three 400's that are semi-flex. So make sure that guy's nib is not an H or a D nib. If you want that kind of flex and can handle a smaller pen, look at vintage ring topos. they are going cheap in ebay and oftentimes will have amazingly flexible nibs. I just picked up a little GF Wahl with a medium super flex nibin superb condition for next to nothing. A quick trip across the workbench and it's dancing across the page again. cant figure out how to upload pics or id show you a writing sample and the pen.